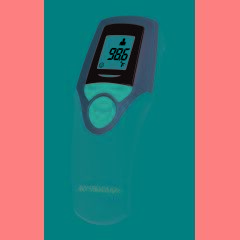 AllegroMedical.com presents The Veridian Touch-Free Infrared Forehead Thermometer. Touchfree infrared thermometer measures body and object and liquid temperatures. Safe, sanitary and noninvasive temperature readings - body temperature measurements taken at forehead. Fever icon indicator quickly identifies normal or high measurements. Illuminated, backlit display for low light use.